» Case Study: What Fraternity Would I Join at the University of Indiana? Last year, I received an off-the-wall question from a reader asking me which fraternity he should join at the University of Idaho. My first thought was to hit delete and move on. However, I got to thinking about it and realized it made a great case study. I would pretend I was a student looking to rush a fraternity at Idaho. I would try to determine the chapters I would rush by following the advice I wrote in my book – How to Join a Fraternity. Then I’d write an article about it. I have been blown away by the popularity of the Idaho article. I still get emails about it from Idaho students. So I’ve decided to make it a weekly article. I will post on a new school every Friday. If you want your school picked – send me an email requesting it. Please note I am making my opinions based on what I find online about the different chapters. I have no idea what the chapters are really like, and I have no agenda promoting or slamming anyone. My goal is for the article to serve as a tool for chapters to see how the outside world sees them so they can improve their online image. The very first thing I did was google “Indiana Fraternities”. This page came up: University of Indiana Fraternities. From there I found a list of chapters and used google to find the website and FB page for each. There are two things that really stand out about AEPi. I love the welcome note from the president on the homepage of their website. It tells their size (220 brothers) and two great accomplishments (#7 GPA and raised $20k+ for their philanthropy). Very impressive. The second thing I like is Parker Mantell’s story. The chapter was recently re-started, and Parker was a founding father. He is extremely accomplished and was selected to be a speaker at IU’s commencement. Parker’s achievements make it clear that this organization has men of high character. I’m very impressed by this chapter. Their website is one of the best chapter websites I have seen (and I’ve seen a lot of them). It is simple, and gives the reader the important information without any filler that would be distracting. This is very well done. I especially like the information on the homepage – #3 chapter GPA and won the Silver Cup and 6 other National Awards. I have no idea what a Silver Cup is, but is sounds pretty important. Their social, recruitment, philanthropy and athletic tabs are very well done. It gives a solid snapshot of what this chapter does without over-doing it. I have no doubt that this is a well-run chapter. ATO’s homepage is in Chinese. Not figuratively. It is literally in Chinese. Not sure if it was hacked or what. Their FB page hasn’t been updated Since 2011. Hard to tell anything about this chapter. This chapter won their national chapter management award this year. That tells a lot about the chapter. I really like two things they do on their site. I like how they have a ‘for parents’ section and I like how they have a ‘myths about pledging’ section. In the parents section they give contact info for parents to reach out to the chapter advisor. Very smart. In the myths section they answer the questions that they know are going to be asked. This chapter is doing a lot of good things. This chapter is extremely impressive. First off, their ‘about’ page on their webpage pretty much describes the perfect chapter. They have been on campus since 1845. That isn’t a typo. Their chapter pre-dates the civil war by 16 years. Their list of accomplishments boasts a phenomenal GPA, a bunch of awards and honors and the student body president is even a brother. Their house is less than 10 years old and looks incredible. These guys are good. For those of you who don’t know (and I didn’t) the Little 500 is a relay bike race that is a big friggin’ deal at Indiana. It appears to be part athletic competition, part social event and part philanthropy. It is THE event at Indiana in the spring. And Delta Chi owns more titles than anyone else. These guys are proud of their Deke history – and should be. They show an infographic that shows a lot of impressive stats to include 5 presidents were Dekes. Their chapter website tells a great story of how two brothers who were fighting on opposite sides met on the battle field in the civil war. For all the great things that are discussed nationally, not much is shared about the local chapter. I’d love to know more about what the local guys do. Fantastic website – one of the best I have seen. Delta Sig doesn’t show what they do with words – they show with pictures. From the looks of it they have been on campus for about a year. They are growing fast and appear to have a great looking house. I really liked the ‘Why Delta Sig’ section of their website. It is very interesting to hear why people join their fraternity. These guys are young but look to be doing great things. Awesome house. DTD seems to kill it in the Little 500 every year. Very involved with their alumni. And that’s about all I can figure out about this chapter online. This is a very impressive chapter. They publish a newsletter titled “The Wrangler” that is posted online. This gives great information about the chapter and the Greek scene at Indiana. In that publication, it states that DU recruited more men than any other chapter in DU nationally. They also grew 31% on the year. That tells me a hell of a lot about the chapter. They have a ton of positive momentum and they must be doing a lot of things right to be attracting so many new members. This is no doubt one of the top up-and-coming houses on campus. This chapter is a smaller chapter, but is doing a lot of things well. Most notably having the #2 GPA on campus. Outside that though there wasn’t much information on this chapter. Their website is simple and clean. It has little more than a letter from the chapter president. There was a lot of good information in that letter though. The president describes the success of their philanthropy and the chapter’s GPA. He also discusses the excitement over the Little 500. I wish there were more pictures up to see what these guys actually do. From the president’s letter it is obvious that the chapter has a lot going for it. I wish they listed who those brothers are. I would love to know. This is also great marketing for the chapter. I really like the free-tutoring service they offer. I take it this is a great way to find potential new members. If so, I wonder if it works. If you are a chapter that is 160+ years old, you are doing an unbelievable job. This chapter has been in their house over 50 years and is obviously one of the best chapters at Indiana. FIJI was founded in 1871. It is crazy how old some of these chapters are at Indiana. I see tomorrow they are celebrating their 122nd annual Frank Norris Pig Dinner. Talk about a tradition. Of course, they are going to have a former governor of the Indiana (and brother) as the keynote speaker. Such an awesome tradition deserves no less. I love how they have a fact section on their website that tells me everything I want to know about the chapter. This section is very well done and shows without a doubt that these guys are really good. Congrats on the new house! Over a year ago the house had an electrical fire and had to be evacuated. The old house was torn down and a new one built. The new one looks great and is a testament to the strength of the alumni of this chapter. The alumni run the housing corporation who own the house. I am sure the past year has been very challenging for the chapter, but hopefully these challenges brought the brothers together. This chapter is very active in giving back to their community. They recently had their Lights the Night philanthropy which raised over $7000 for the Leukemia and Lymphoma Society. I’m very impressed by their dedication to giving back to others. No doubt this is a great chapter. PKT comes out strong on their homepage. In the front and center the announce they won five different awards at their fraternity’s national convention. Anytime a chapter is recognized nationally it is a great accomplishment. I’d be curious to know what the story is with the 15 brothers or so pictured in Army uniforms. If the chapter has that many brothers in the military it would be very unique. No doubt these guys are high speed. What an amazing chapter. A couple things really stand out. First off, holy crap what a house. Second, congrats on being recognized as their national chapter of the year. What an impressive honor. Third, I love the simplicity of their site which gives a great glimpse into their chapter. I love the events tab and specifically the Mom’s Prom event. What a great idea. Finally, it looks like the last two semesters the chapter has recruited 30+ men for each class. When you have such strong recruitment, it is obvious that the chapter is doing a lot of things right. This has to be a top house at Indiana. Not too much information out there about this chapter. Their FB page is way outdated. Their website doesn’t tell us much. Their twitter tells us they recently beat the hell out of SAE in flag football, but that is it. PKA is typically a strong fraternity on every campus I’ve ever been to. I am sure this chapter is no different but it hard to tell that with the information available online. Not much out there on this chapter. The house looks amazing, and there were some impressive chapter awards listed. Outside that there wasn’t much information available on the local chapter. Pilam has started a new colony at IU this semester. I joined a colony as an undergrad and it was an amazing experience. I cherish the memories I had, and I am proud that I helped start traditions that have lasted almost 20 years and hopefully will last many more. I wish these guys the best of luck on their journey to becoming a top house on campus. SAE does a smart thing – they have a blog that they keep updated. It gives a short recap of chapter events and gives great insight into what they are doing and what they are all about. For example, they recently posted how they coach youth soccer. What an awesome way to volunteer and make a difference. These are definitely some of the good guys out there. The website of this chapter talks about how they are the fastest growing multicultural fraternity. However, it really doesn’t tell too much about what the do at the local level. This is an interesting fraternity that is different than most in the IFC. I’d love to know more, but that information isn’t available online. Sigma Chi has been on campus since 1858. Their house is fantastic. That is about all I can find out about this chapter. Sigma Nu has been on campus since 1892. Their rush schedule from 2007 is on their webpage. That is about all I can find out about this chapter. The chapter’s GPA was first among fraternities. The Indiana IFC has recognized Sig Ep as the Chapter of the Year five out of the last six years. They have been awarded 7 Buchanan Cups – which is their national fraternity’s award for demonstrating the highest level of undergraduate achievement. Not sure how you can get more awesome. There is a lot of very general information about Sigma Pi. Nothing too specific that would tell you much about the chapter or what the chapter does. There is a lot of positive momentum at TKE. They were recently chartered and won a bunch of awards at their national convention. They had huge recruitment success. They are a indoor soccer dynasty. This is a young chapter that is doing great things. Here are some good resources for those wanting to rush a fraternity at Indiana. 1 – The Little 500 is one of the coolest events I have ever heard of. What a great way for the community to come together to have fun for a great cause. 2 – The age of some of these chapters is stunning. The tradition and history of those chapters is really something to behold. Those chapters should be admired and treasured at Indiana. 3 – Several of the chapters completely ignore their online presence. From a marketing perspective, this is a foolish move. This is the window to your chapter to many outsiders, including perspective new members. I had no idea Indiana’s Greek Life was so robust. It is obvious there are a bunch of very strong chapters on campus. Super old chapters, The Little 500, numerous national awards and a fantastic social scene are just a small part of what makes Indiana’s Greek Life great. I came away very impressed by these chapters. Realize I know nothing about any chapter at Indiana besides what I found online. This case study is to provide a perspective of how an outsider would view your chapter. Use this information to improve your chapter’s online image. If you have anything to add – please leave it in the comment section below. 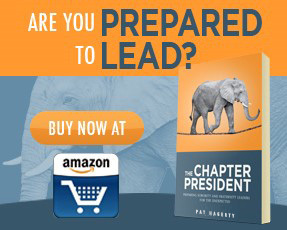 For those of you looking to improve your fraternity, please check out my book The Fraternity Leader – The Complete Guide to Improving Your Chapter. This book is a must read for any Greek Leader.